The advent of the Tripartite First Nations Health Plan (2007) presented a favourable opportunity to establish the FNHDA to work alongside the First Nations Health Council (FNHC), and the Federal and Provincial governments in a new tripartite relationship. The FNHDA is a pillar in the new First Nations health governance arrangement and acts as technical advisor to its partners, the federal and provincial governments (including the regional health authorities), the FNHC and the new First Nations Health Authority (once it is established). Through their unique vantage point as managers responsible for delivering front-line health services for First Nations community members — Health Directors see, feel and hear the health needs of community members every day of their lives. This informs their responsibility to plan, coordinate and manage services (as well as other services of other health providers) aimed at meeting those needs. To view the British Columbia Tripartite Framework Agreement on First Nation Health Governance click here. 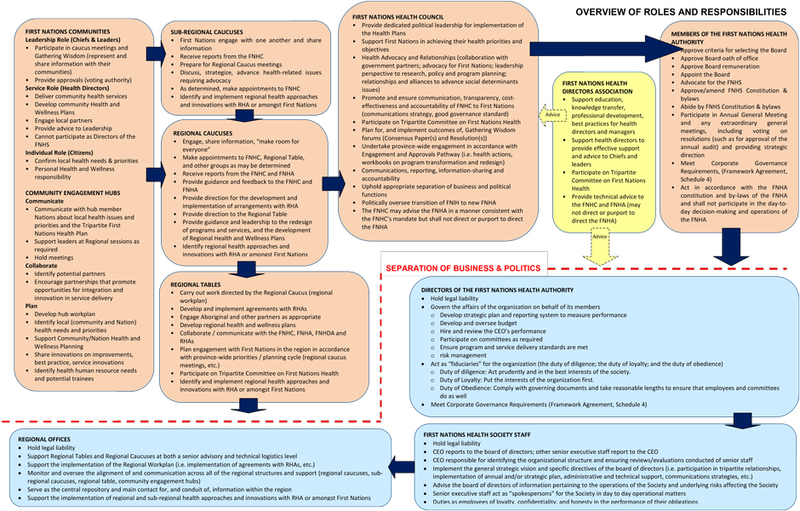 To view the British Columbia First Nations Perspectives on a New Health Governance Arrangement – CONSENSUS PAPER click here. The First Nations Health Directors Association is a membership-based professional organization dedicated to supporting health directors and managers working in First Nations communities across British Columbia. Our mission is to advocate for change, build partnerships, and support the development of First Nations Health Directors, their mandated health organizations and others to build competence and excellence in traditional First Nations wellness. Our members are the lead administrators of health programs in First Nations communities, managing health facilities, addictions treatment centres, or health centres. They provide services for community members with complex health and social needs while juggling multiple responsibilities of health service delivery including managing health human resources and financial resources. Our Association supports education, knowledge transfer, professional development, and sharing best practices amongst our membership. We also act as a technical advisory body to our partners – First Nations Health Council and the First Nations Health Authority – on research, policy, program planning and design, and the implementation of the Health Plans endorsed by BC’s First Nations leadership. While the FNHDA is a relatively new organization, First Nations health directors and administrators had been advocating for its creation as First Nations leaders and federal and provincial governments committed to improving health services in 2005. With such broad-based community support, the First Nations Health Directors Association has experienced strong growth in just over two years. Our organization is currently governed by a fifteen-member Board of Directors representing BC’s five health regions, and serves a fast growing membership base of over 175 health administrators working in First Nations communities, both on and off-reserve, throughout BC. Our Association has made much progress over the years developing our corporate systems, strengthening partnerships, building our membership base, community engagement, and delivering training to support efforts to improve health care services and delivery in our communities. Our Association and membership are well positioned to make a significant contribution to support First Nations to determine and achieve their own health outcomes as political discussions are intensely focused on improving health care services for First Nations. Since 2005, First Nations in BC, and federal and provincial governments have been committed to a shared agenda through the Transformative Change Accord, to work in partnership to improve outcomes for First Nations in BC in several areas including health. In relation to health, First Nations have provided leadership and guidance in formulating a series of political agreements between our Nations and the federal and provincial governments to facilitate the transition to a new First Nations health governance structure in BC. The signing of the Framework Agreement in October 2011 set in place the legal basis to transfer the operations of Health Canada’s First Nations Inuit Health Branch-BC Region to the First Nations Health Authority. For the first time in Canada, First Nations in British Columbia are embarking on an exciting and empowering journey to ensure decision-making over health services to realize our vision of healthy, self-determining, vibrant, BC First Nations children, families, and communities. The unfolding of a new First Nations health governance arrangement in BC presented an opportunity to establish an association of health administrators to make a significant impact on enhancing the health and well-being of our First Nations community. 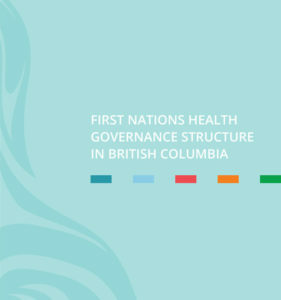 The First Nations Health Directors Association has an important part in the new First Nations health governance structure, as endorsed by First Nations Chiefs and leaders in relation to the Consensus Paper 2011: First Nations Perspectives on a New Health Governance Arrangement in May 2011. Most recently, the FNHDA, First Nations Health Council, and the First Nations Health Authority signed a relationship agreement to formalize our commitment to building an effective partnership based on shared values and understanding of our collective and respective roles, responsibilities, and accountabilities in the new First Nations health governance arrangement. This agreement also reinforces our commitment to uphold the Seven Directives adopted by BC First Nations, including the strategic level standard of ensuring a community-driven Nation-based approach to improve services and develop capacity. It is a great honour for the First Nations Health Directors Association to work alongside our key partners in the new First Nations health governance arrangement. FAQs – How does the Association work?